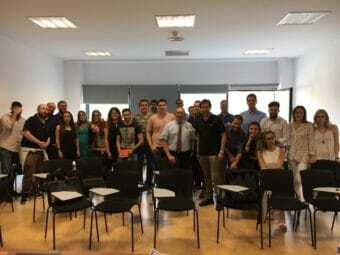 Dr. Roger Mason spent two days at Juan Carlos University in Madrid with the students of the cathedra Servicios de Inteligencia Democraticos, the Intelligence Services and Democratic Systems or SISD. Dr. Mason is part of the SISD Visiting Masters program. The visiting masters are subject matter experts, researchers, and academics from around the world who serve as visiting faculty for the SISD program. The SISD program has four core subject areas: intelligence analysis, competitive intelligence, ethics, and simulations and games. Students in the program include new grad students looking for a career as an intelligence analyst and mid-career professionals looking for new knowledge and skills sets to give them a competitive edge. Dr. Mason provided a two day seminar on wargaming. The curriculum included: an introduction and theory of wargames, overview of wargaming practices in the intelligence community, and the history of wargames. A focal point for the seminar was the use of wargming in intelligence analysis. The seminar also included two historic case studies: the Vietnam era Sigma 64 game and the cold war Able Archer ’83 wargame. The students debated the hazards of ignoring wargame results and manipulating outcomes. They also explored the challenges of analysis bias and reliance on preconceptions for analytic conclusions. The two day seminar concluded with a two hour session of wargaming. Dr. Mason has developed a new wargame for the Art of Intelligence: Vol. II. This book is intended for academics using simulations and games to teach intelligence analysis. The book provides samples of models, simulations, and games. The game is called The Intelligence Sovereignty Game. 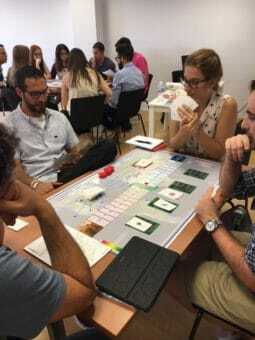 The game scenario places the player in the position of leading an EU intelligence service attempting to balance the need to preserve their country’s intelligence sovereignty while cooperating with other EU players to prevent a terrorist attack. When asked about the students Dr. Mason replied, “I loved working with the students. I had an opportunity to speak with many of them and discuss their program goals and career interests. I especially enjoyed advising two students with real world projects. They wish to employ wargamng techniques as part of their problem analysis and threat assessment efforts.” Dr. Mason is looking forward to returning next year and participating in this exciting program.